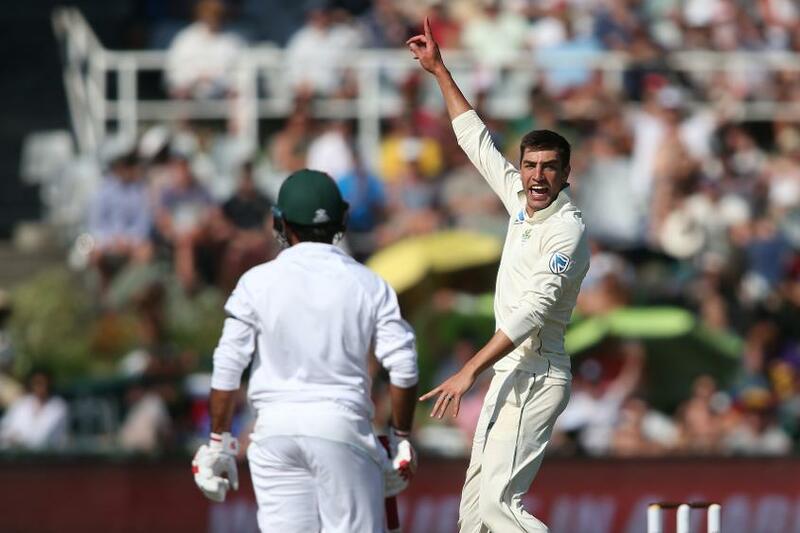 South Africa fast bowler Duanne Olivier has reached a career-best 24th position in the MRF Tyres ICC Test Player Rankings after another stellar performance in the final Test in Johannesburg, which his side won by 107 runs to complete a 3-0 series sweep over Pakistan. Olivier’s match haul of eight for 125 in the final game has lifted him eight slots in the list led by his compatriot Kagiso Rabada. His 24 wickets in the series not only got him the player of the series award, but also see him gain 29 slots overall in the rankings after starting the series in 53rd place. South Africa, who have reached second position in the MRF Tyres ICC Test Team Rankings after their impressive series victory, also had their batsmen move up the rankings with Johannesburg man of the match Quinton de Kock (18 and 129 runs in his two innings) gaining 12 berths to reach 14th position. Former captain Hashim Amla (up three places to 10th) and opener Aiden Markram (up two places to eighth) have also made significant gains. For Pakistan, Babar Azam has moved up five places to a career-best 20th position and Asad Shafiq is not far behind after inching up one slot to 23rd place. Openers Imam-ul-Haq (up 23 places to 73rd) and Shan Masood (up two places to 63rd) have also reached career-best positions. Among their bowlers, Mohammad Amir has gained three slots to reach 31st position while other fast bowler Faheem Ashraf has lifted 48 slots to a career-best 58th position after finishing with six wickets in the match. Spinner Shadab Khan has also reached a career-best place after gaining 23 places to reach 78th in the list. The emphatic series win has helped South Africa overtake New Zealand and England in the team rankings. South Africa have gained four points to reach 110 points, two points above England in the list led by India with 116 points. Pakistan have slipped behind Sri Lanka to seventh place and 88 points.